Home / How does the 285-tons transformer travel to the EPS plant? Transportation of the block transformer of about 285 tons for EPS Thermal Power Plant Kostolac B started from the Stig Railway Station, near the Bratinac village close to the city of Pozarevac. A 9.5-meter long and a 5-meter-wide transformer with extensions will travel for two days to arrive in the power plant on Sunday. “By servicing this transformer we will increase the reliability of the blocks in the "Kostolac B" thermal power plant, which is very important for the Kostolac branch of EPS. The transformer will be in reserve, which ensures an uninterrupted and comfortable operation of the thermal power plant”, according to the statement. “Last year was a record year for electricity production in Kostolac, and the servicing of this transformer will increase reliability and safety in operation and enable us to continue to maintain the high standards we have so far”, says the director of electricity generation in TE-KO Kostolac, Nenad Markovic. The block transformer was manufactured in the "Rade Koncar" plant in 1986 and it was constantly in use in the "Kostolac B" thermal power plant until 2014. The power of the transformer is 410 MVA, and it has more than 62 tons of transformer oil in it. The repair started in July 2016 in the “Comel transformatori” plant from Ripanj, and it was completed in December. 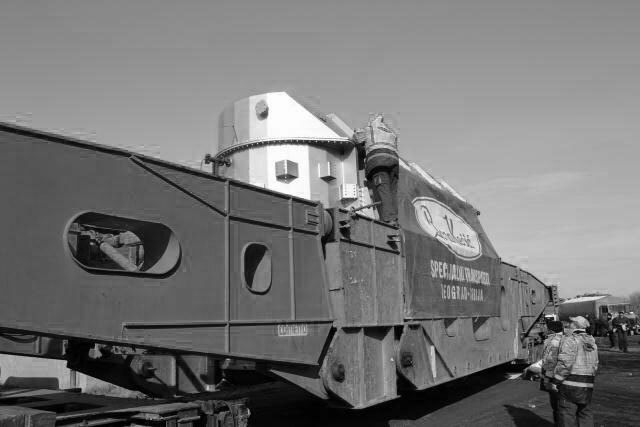 On Saturday we will transport transformer eight kilometers by a towing train. On Sunday morning, we will head through Bradarac, and then through the villages of Maljurevac and Drmno, until we bring it to the Thermoelectric Power Plant “Kostolac B”. For this special job, the Belgrade-based company "Bora Kečić – specijalni transporti” was engaged," said Djordje Dugić, a high-voltage engineer in the "Kostolac B" Thermal Power Plant, who is following the transport.